Our Jotul F100 Nordic QT wood heat stove. 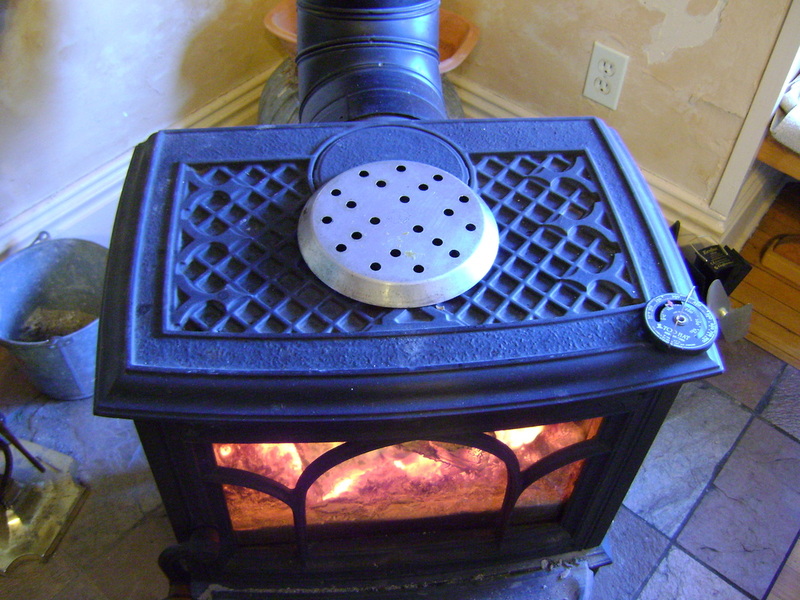 See also the main page about Our Wood Stove, with lots of information about the many other uses of a wood stove, as well as buying and maintaining one. 2. 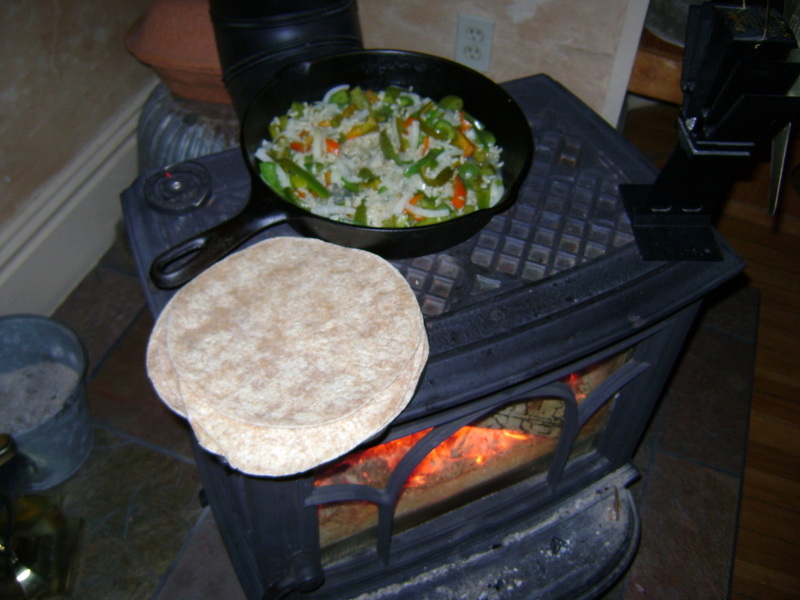 Why Cook on the Wood Stove? 1. 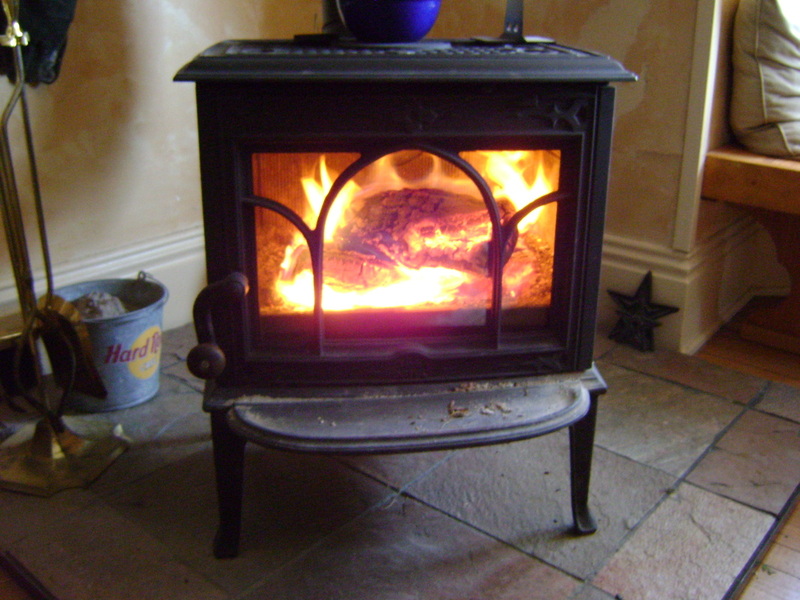 Wood heat stoves heat a room or house by burning wood. You can also use them to cook food, even if they weren't specifically designed for it. Any wood heat stove with a large enough flat surface on top to hold a pot can be used for cooking. The wood heat stove in our library. 2. Wood cook stoves are meant to be installed in the kitchen primarily for cooking food with wood, although it also heats the room. It normally includes a built in oven for baking, as sometimes has a reservoir for heating water. 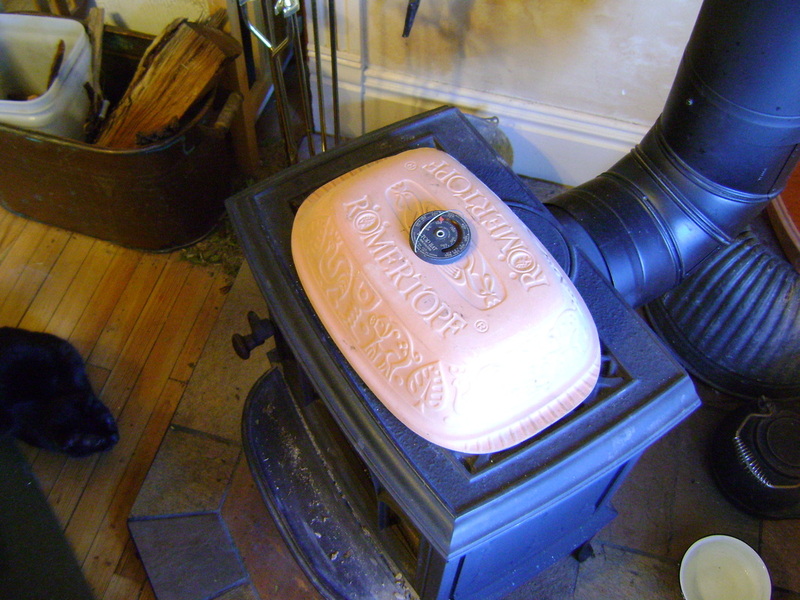 A wood cook stove at Old World Wisconsin. 2. Why Cook on the Wood Heat Stove? It Uses Less Resources: If we’re already heating our house with the wood stove, we save resources by using that same heat to cook our food. To Be Prepared for Emergencies: If we lose electricity during a Winter storm, we will still be able to cook our meals. Waiting until we’re actually in an emergency to learn the skills needed to cook on a wood stove doesn’t seem wise. Types of Cooking: You can use the top of the wood heat stove to cook anything you normally cook on top of your electric or gas range. Since you can’t turn a knob to adjust the flames, though, you need to learn other ways to control the temperature, so you can create more heat when you want to fry something in a skillet or less heat when you want to simmer something slowly in a pot. Find the Sweet (Hottest) Spot and the Slow Cooking Spot: The key to controlling cooking temperature is to get to know the personality of your stove. Begin by finding the sweet spot, where it gets the hottest on top, so you'll know where you can cook food the fastest. Originally, we could not find a sweet spot on our stove. Ours is one of the smallest models on the market. When we had it installed, the chimney rose directly out of the top (where the circular area is shown in the photo to the right), which didn't leave enough room for a pot unless it hung over the edge. It took forever to heat up food and frying wasn't really a possibility. Eventually, we had the chimney moved so that it now comes out of the back of the stove, leaving us the entire top for cooking. The round plate where the chimney used to rise out of the stove turned out to be our sweet spot (where the thermometer is in the photo top right). Anything we place on that spot can be boiled or fried, if our fire is hot enough, while anything we place farther away from it will cook more slowly. If we want to keep something warm without overcooking it, we place it away from the sweet spot. Build a Hotter Fire: If you want to cook more quickly, build a hotter fire by using several thinner logs (3-4" in diameter) in the firebox, rather than one large one. The thinner logs burn faster so give off more heat. For the fastest cooking, you want the firebox filled with as much flame as possible to heat the top of the stove. Preheating Pans: To speed up cooking, preheat your pan, by placing it empty on top of the stove. The food will heat faster if the pan and lid are already hot when you add the food. 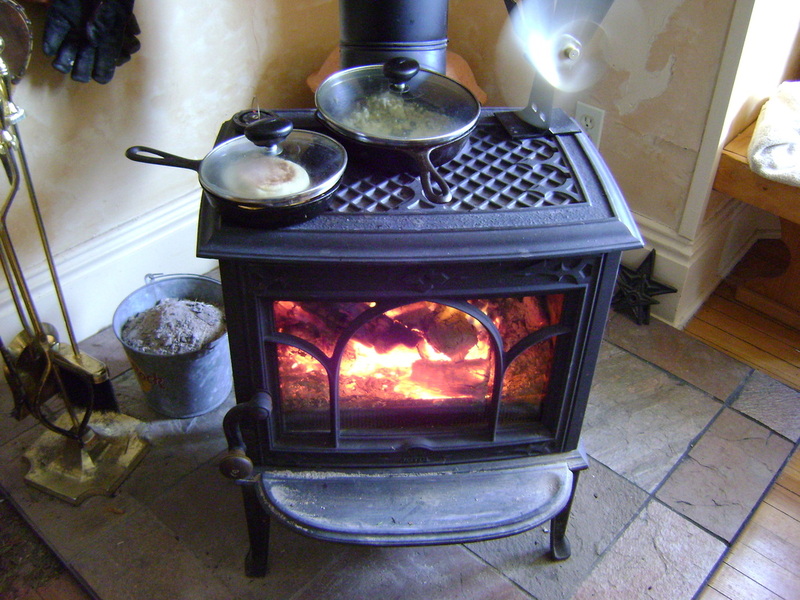 You can use any of your normal pots and pans on the wood stove. We prefer cast iron, but have also used enamel and stainless steel. Pans with thinner walls, like enamel, will heat up more quickly and cook food faster. Use a Lid: Using a tight fitting lid will trap heat and help food cook faster. You May Need to Rotate the Food: Food may heat unevenly, depending on how close it is to the sweet spot, so if you have a small stove top like ours, you may need to stir the food in the pan more often, or turn the pan periodically to get everything done evenly. Timing: How fast food cooks will vary depending on how hot your fire is, so you can’t always rely on the cooking time listed in a recipe or assume that it will take as long as it took the last time you cooked it on the wood stove. It may take longer, or it can sometimes burn fast if your fire is hotter than you think. Keep a closer watch on your food until you get used to how your stove works. When you start to smell the food or hear it cooking, check to see if it's done. An oven cooks by surrounding food on all sides with a steady, low heat. 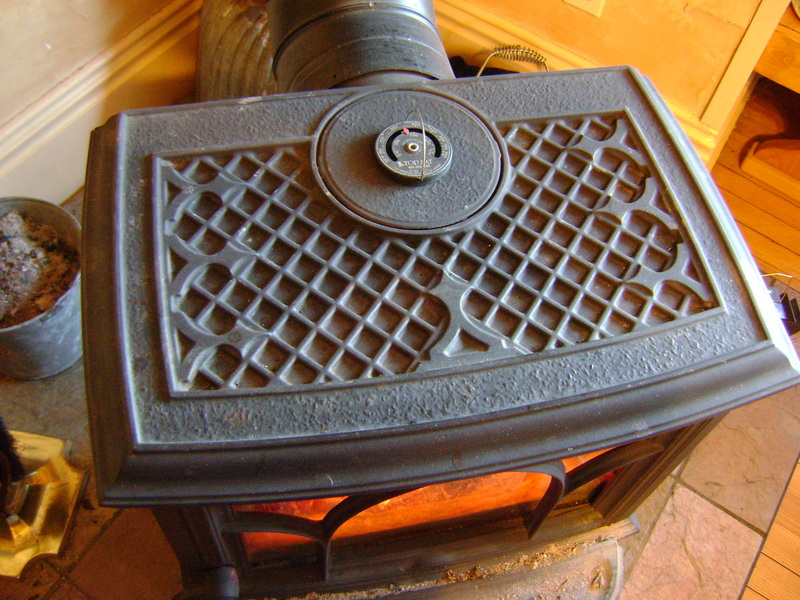 You can use this information to create an oven on top of your wood heat stove. All you need is a trivet that will elevate the food (working like the rack in a conventional oven). The trivet will keep the food from coming into direct contact with the surface of the stove so that it doesn't overheat or burn. Cover the trivet with a pot that is big enough to turn upside down over the food to create the walls of the oven and hold in the heat. Trivets: I have had trouble finding an appropriate trivet. The first one I bought seemed to be cast iron, but it must have had a painted surface because it started smoking when I put it on the stove. I couldn’t find any others that were small enough to fit inside a pot. Recently, Bear brought home from work some small pie pans they were getting rid of. They are about 6” across and have holes in them. I realized they could be great trivets when turned upside down (see photo to right). Pots: I’ve used different pots for the top of the oven. I’ve turned our large cast iron pot upside down, but the handle gets in the way and doesn’t let the pot sit as flush with the woodstove, so probably lets some heat escape. Our Romertopf clay roasting pot (see photo at right) has worked well. Our enamel roasting pan would probably also work well and would be larger. The “firebox” is the main part of the wood stove. It’s the “box” in which the fire is actually burning. You can cook in the firebox the way you would cook over a campfire. Let the flames die down and cook the food on the red hot coals. It took us a while to find a grate that would fit in our tiny firebox, and it was hard to work with because it doesn't have legs. Then Bear realized it was even easier to use a grilling basket. Click to see how Bear cooks whole beets and steak in the firebox and why I don't cook baked potatoes this way. The coals in this firebox are a little too hot to use for cooking. Using Bear's new friend, the grill basket, to make toast. 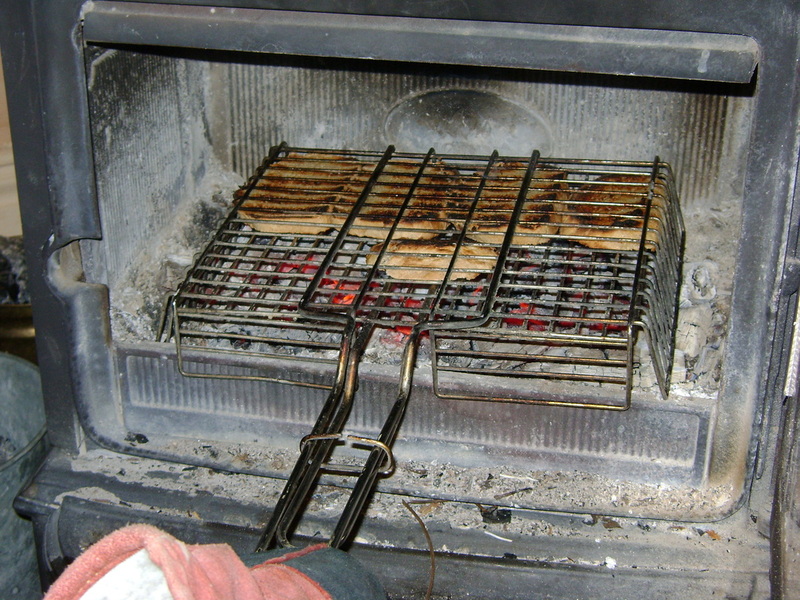 A grate propped on chunks of wood in the firebox to cook venison. Hand Protection: Make sure you’re using appropriate protection for your hands. We have a pair of leather gloves that came with the wood stove that are meant to protect your hands when putting logs on the fire, and we have a pair of ‘Ove’ Gloves which withstand heat to 540 degrees F. The later fit my small hands better, and are less stiff, so I use them more often for cooking. 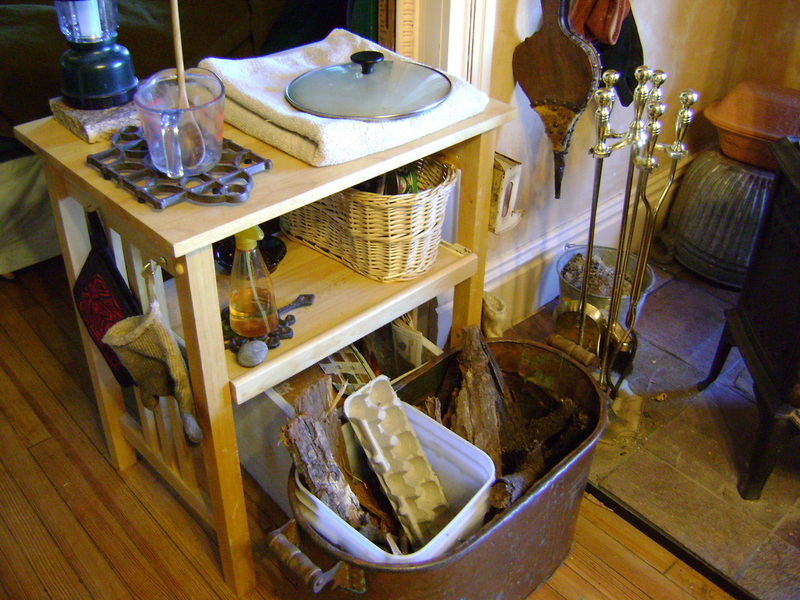 Supply Table: Our wood stove is in the room next to our kitchen, so carrying cooking ingredients back and forth is not too difficult. However, we also bought a small computer table at a garage sale and modified it to use next to the wood stove (we moved the keyboard tray down farther to make a shelf). It has trivets on which we can set hot lids while we’re checking food, space for stirring spoons and other equipment, and hooks to hold our oven mitts. Tea Pot: If you keep a tea pot on the stove (with the lid off), the evaporating water will help humidify your house and you will always have hot water ready. We used a cast iron pot in the beginning, but since our wood stove isn't in use when we're not home, the water sitting in the pot made the cast iron rust when there was no fire. We switched to an enamel tea pot instead. Safety: It's more dangerous to cook with a wood heat stove. Unlike conventional stoves, if you bump into it you will burn yourself. The hearth can be a tripping hazard. Be extra careful. Drying Laundry with a Wood Stove: See the laundry section of our website for yet another function that the wood stove can serve. Hot water is always ready in our enamel teapot. 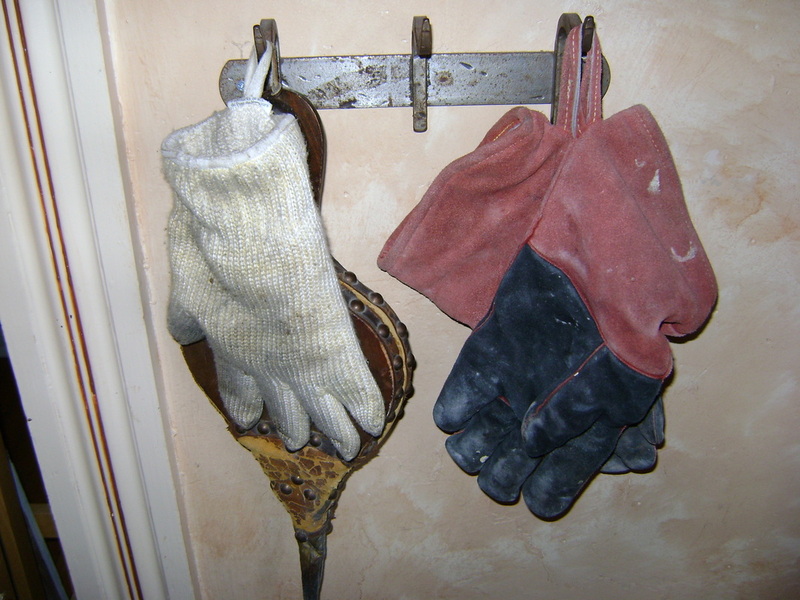 Hand Protection: pale yellow 'Ove' Glove on left, red & black leather gloves on right. 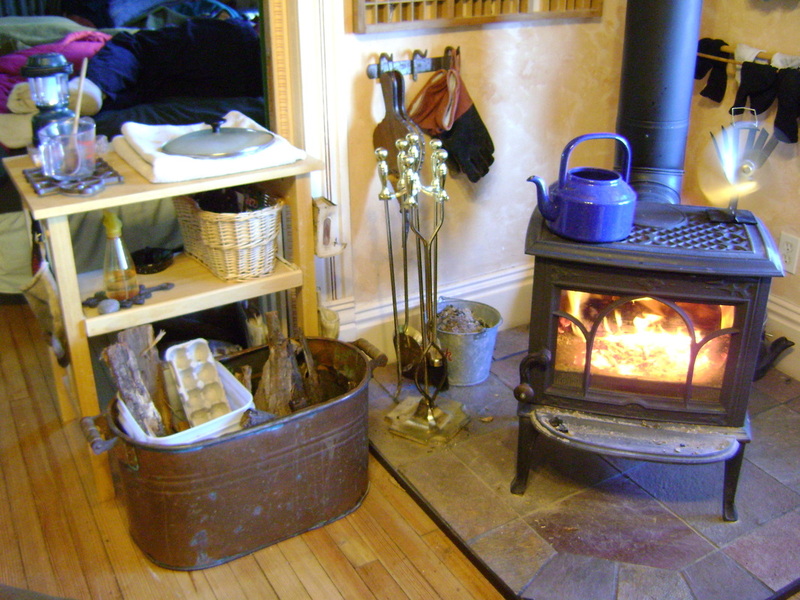 Our cooking supply table and kindling bins next to our wood stove. 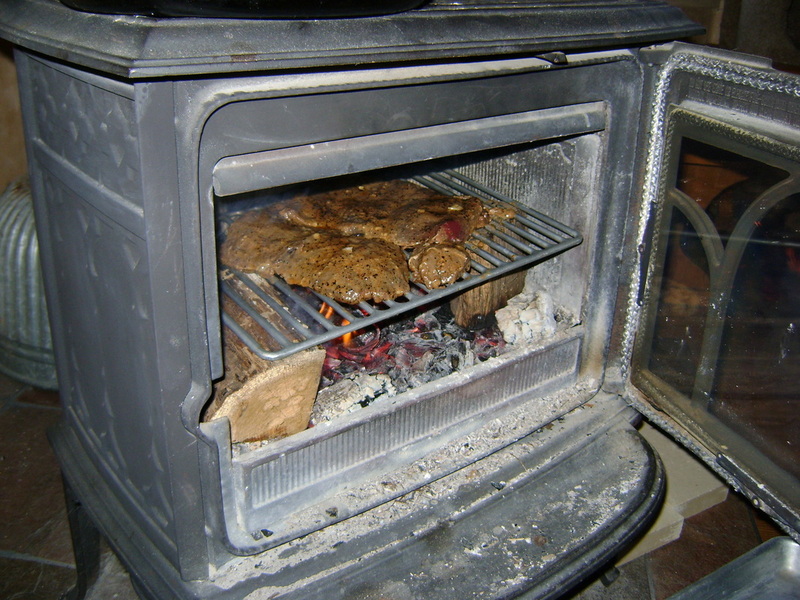 Good general information on how to cook with a heat stove and almost 300 collected wood stove recipes. This book is about using wood cook stoves. It is full of useful information about traditional ways to use and work with old-fashioned cook stoves, as well as many recipes, that can also be applied to a wood heat stove. 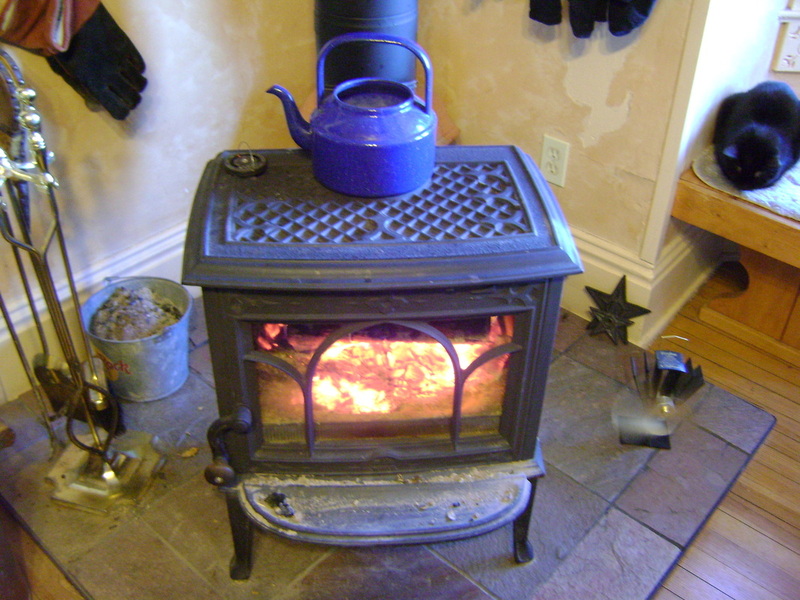 ​with lots of information about buying, using, and maintaining a wood stove.